How did plant-eaters find food? Plants common in the age of the dinosaurs included ginkgo trees, palm-like trees, coniferous trees, and ferns and mosses. It is likely that herbivorous dinosaurs ate all these plants. Different plant-eating dinosaurs developed different ways of breaking down their food. Sauropods, such as Barosaurus, raked foliage into their mouths with peg-like teeth and swallowed it whole. It was then broken down in their digestive systems. Other plan-eating dinosaurs ground down plant matter with their teeth before swallowing. Their enormous size meant that sauropods had to spend nearly all their time eating just to generate enough energy to stay alive. They probably fed mostly on coniferous trees, steadily munching their way through entire forests. It is this continuous eating that may have created what is known as a “browse line”, leaving trees bare of leaves below a certain level. Were there flowers and grass? Flowering plants first appeared in the early Cretaceous Period. 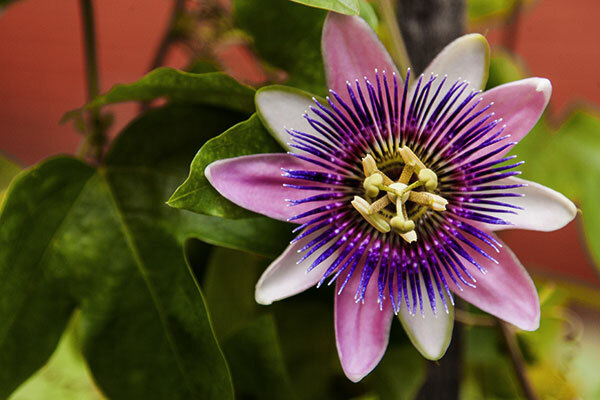 Passion flowers, as well as flowering trees such as magnolia, beech, oak, maple, and walnut joined earlier plants. It is likely that dinosaurs ate the new flowers alongside leafy plant matter. Recent evidence from dinosaur droppings (coprolites) shows that some sauropods also munched on grass. Could a plant-eater chew its food? 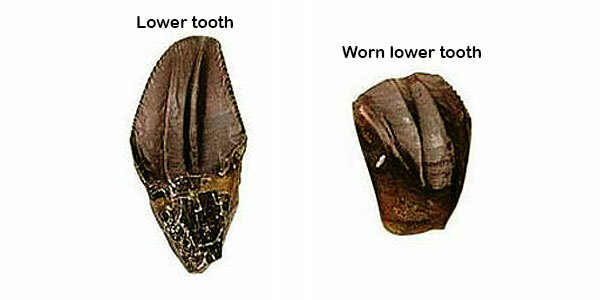 Plant-eaters didn’t have molars, like humans, and many could not chew. But some had toothless, horny beaks for snipping plants, as well as rows of teeth in their cheeks for grinding them down. Each tooth was coarsely serrated. Years of grinding tough plants wore teeth down. Those shown here are from a Iguanodon. One is in good condition, the other is worn. 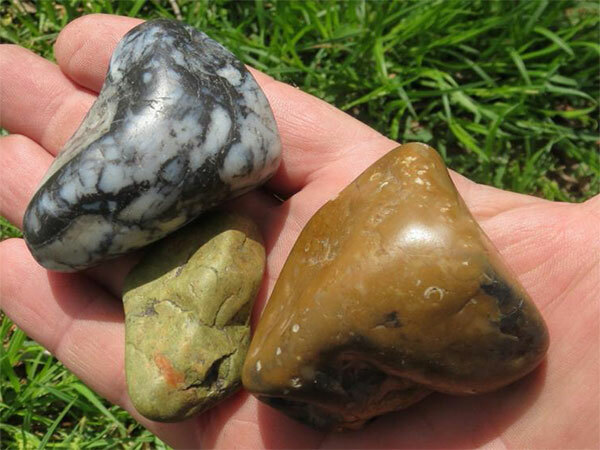 These smooth stones, known as gastroliths, were recovered from the skeletons of various sauropods. Perhaps the dinosaurs had deliberately swallowed stones to aid their digestion. The stones might have stayed in a dinosaur’s digestive system, grinding up the vegetation that it swallowed. However, it is more than likely that raw vegetation was broken down by special bacteria, as happens in the stomachs of cows. 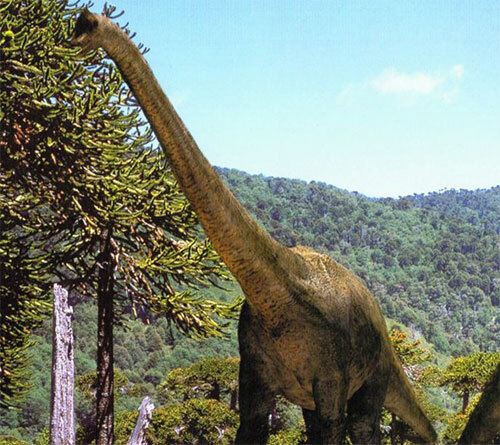 Some long-necked dinosaurs probably lifted their heads to reach high up in the trees. Others, such as the Thecodontosaurus, may also have used them to reach into the middle of low-growing plants. Thecodontosaurus was a likely ancestor of the sauropods, and had a much shorter neck than its later relatives. As the plant-eaters’ teeth wore down, new ones grew to replace them. Duck-billed dinosaur Edmontosaurus had about 1,000 teeth in its cheeks, more than any other dinosaur. 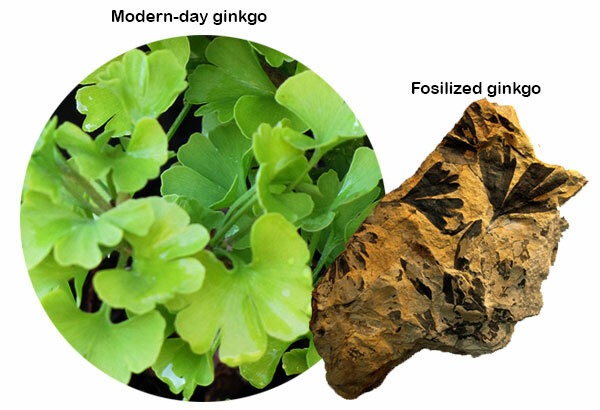 Many of the plants that dinosaurs ate, such as ginkgo and ferns, are till common today. 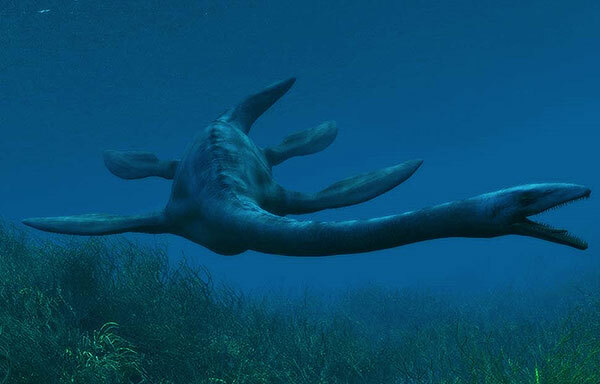 Fish-eating sea creature Elasmosaurus had a neck 7m (23ft) long, half its body length. It probably used this long neck to ambush fish swimming above it.